I've been remiss in my posts lately because the post I have been working on has been dark, heavy. After all, the road to rescue is painful, often the result of failure after failure on the part of dogs' human companions. So let me tell a different story today, the story of Roxy. Last night, Bob and I were invited to share fondue with Kate and Greg Pickman of Pick2 Design and Advertising, two members of the three-person family who adopted Roxy (the handsome girl pictured here--and at the bottom of their webpage). Anyhow, to state that Roxy is thrilled to be living in her new home (since July), would be an understatement. She greeted me at the door with an enthusiasm that I never witnessed when she was my foster. She ran between people joyfully; she frolicked, attempted to find her toys so she could show them to us, and generally exhibited the behaviors of a well-adjusted dog that has never experienced disappointment. But that's not Roxy's story. 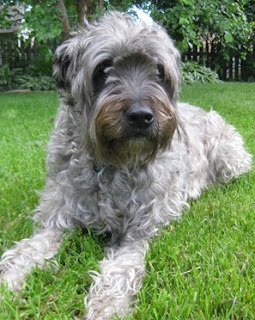 Roxy, a Wheaton terrier cross, and her littler mates came to Second Chance through a puppy mill. She was one of the cutest pups you could imagine (which, by the way, may be th e kiss of death for dogs because they're frequently pushed aside for the next novelty that comes along after they've grown). Not surprisingly, Roxy (then Shelby) was adopted quickly. I can't tell you much about her original family because I wasn't her fosterer, but I can tell you things didn't go well in her first home. Roxy was returned within months and was reported to have developed problem behaviors, nipping, if I recall correctly. But another family was waiting to adopt her. This was a youngish couple--no kids. They doted on Roxy, took her for walks, brought her to dog parks, treated her like the child they didn't have. And then, you guessed it, they had a child. Relegated to the front porch where Roxy barked incessantly at passerbys, over time, she grew jumpy, reactive, and overly protective of the woman and child. It escalated until last year on St. Patrick's day Roxy was left chained outside on a busy street where she did the unthinkable: bit a drunk rollerblader passing by her. Roxy was once again returned to Second Chance, and this time she became my foster--probably around the 160th. She was reserved, uncomfortable, and disengaged. I was kind to her, let her spend time back yard where she would sun herself, but she was withdrawn from the large, boisterous pack at my house, a bit like Ferdinand the Bull. (You remember him, don't you?) And so, when there was considerable interest in her, I was very pleased. And the second's dogs were not all that interested in adding one to their pack. Still, I held out for the right home. Roxy deserved that much, after all. And then Kate called me. She told me that she had lived with a challenging dog--which Roxy, by this time, had been labeled as. She had a large, fenced yard, and Roxy would be an only dog. Her son was a gentle, kind young adult. And she and her husband worked at home! Over multiple conversations and a visit, we discovered that Kate, Ron, and their son would be the perfect family for Roxy. And they are, too. Plus they make a mean fondue! So, what's the message of this post? I don't know. Maybe that problem dogs don't always start that way. I'm certain that Roxy didn't. Rather, their human companions betray them, and when the dogs behave predictably, their families dispose of them. But Kate and Ron and their son demonstrate that unconditional works as well on dogs as it does on humans. Maybe it seems too simple, but there you have it. Roxy is happy; Roxy is home. And maybe that makes all this heartache just a little more bearable. I'd write more, but I must be off--to help save a dog. Big surprise, right?